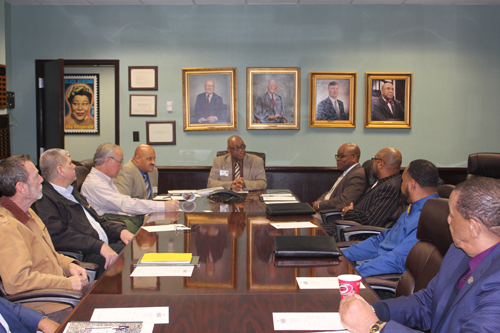 HCC Hosts Kennametal for Partnership. WELDON, N.C. – Halifax Community College hosted executives from Kennametal on March 14 for a tour of the Industrial Systems Technology labs. The two organizations are hoping to partner for industry training programs. "HCC is striving to meet the workforce needs of the employers in our service area," said Dr. Michael Elam, president of HCC. "We have set a strategic goal to ensure that every student receiving a certificate or degree from HCC is work ready day one. In order to accomplish this goal, we must start by listening to our industry customers so that we can align our curriculum with their training needs. We are delighted that Kennametal has pledged to partner with us in this regard." The partnership is part of the Tech Hire program, one of four US Department of Labor programs funded at $1 million each for HCC and three other NC community colleges. Tech Hire is designed to assist young adults, ages 17 to 29, move from unemployment to full-time unsubsidized employment through a series of programs. 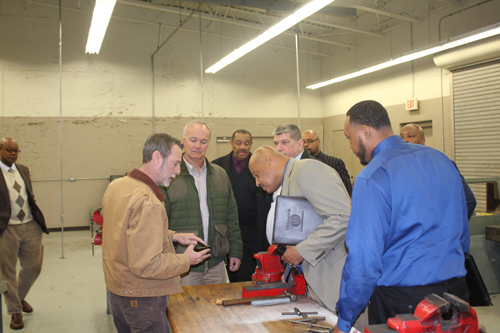 For HCC, students will be trained in welding and industrial systems. "The College has made great progress in keeping up with the needs of local industry," said Jeff Kahl, plant manager for Kennametal. "The current job market requires various technical job skills that are becoming increasingly difficult to obtain in manufacturing. The services and training provided by Halifax Community College will greatly aid in the success of our business." Dr. Michael Elam discusses a partnership with Kennametal executives, Jeff Kahl, Plant Manager, and Richard Tudor, Facilities Maintenance Manager.